Draft data - do not cite or quote EEPS Benthos 2008 1.RMP Status & Trends sediment monitoring added benthos at 27 stations in 2008 for implementing SQO. 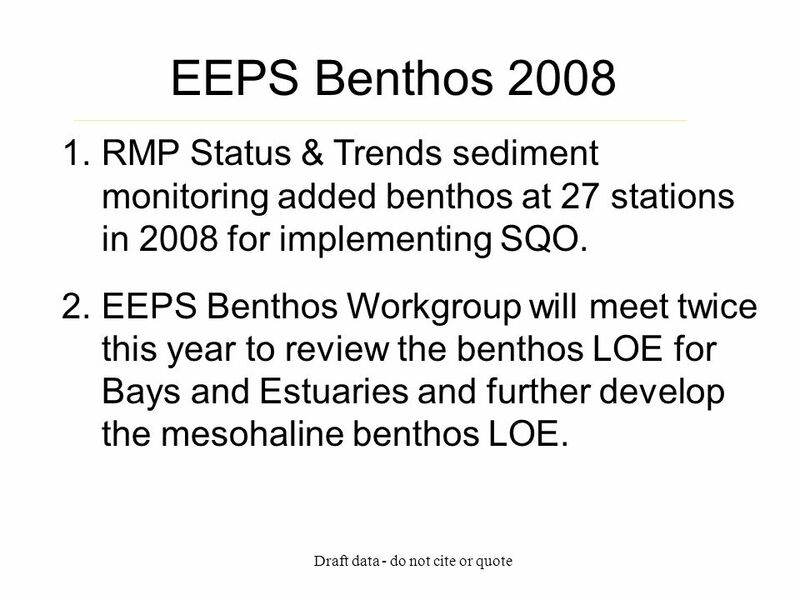 1 Draft data - do not cite or quote EEPS Benthos 2008 1.RMP Status & Trends sediment monitoring added benthos at 27 stations in 2008 for implementing SQO. 2.EEPS Benthos Workgroup will meet twice this year to review the benthos LOE for Bays and Estuaries and further develop the mesohaline benthos LOE. 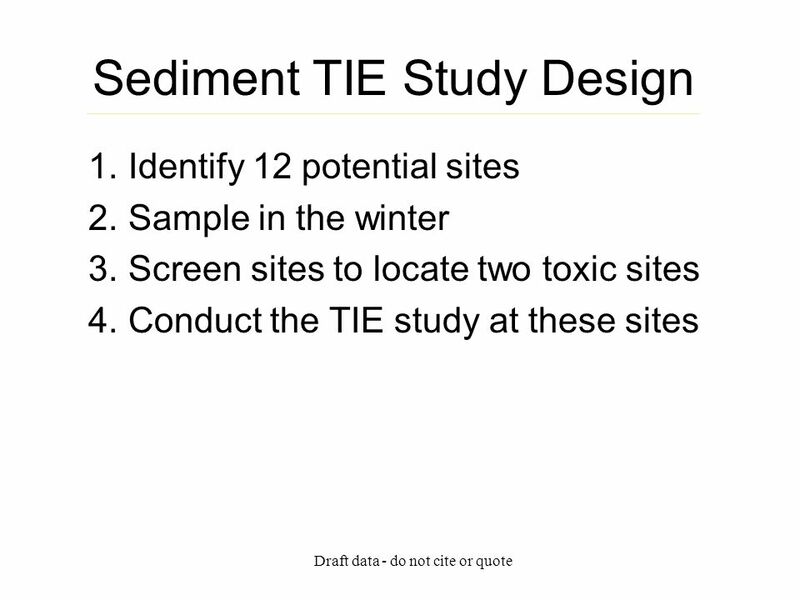 2 Draft data - do not cite or quote Causes of Sediment Toxicity Sediment TIE Study (2007-2008) The goal of this study is to refine newly developed estuarine amphipod sediment Toxicity Identification Evaluation (TIE) methods for eventual use in evaluating toxic samples from RMP S&T samples. Download ppt "Draft data - do not cite or quote EEPS Benthos 2008 1.RMP Status & Trends sediment monitoring added benthos at 27 stations in 2008 for implementing SQO." Timeline and Product Development Aug-Oct 2007Recovery Plan completed and adopted Recovery Plan Adaptive Management Framework developed and adopted. 4.26 CEP/RMP Sediment Core Plan Draft & Comments CFWG Sept 2005. BACKGROUND AND STATUS of RMP SEDIMENT STUDIES RMP EEWG MEETING September 6, 2007. RMP PROPOSAL SQO BENTHIC DEMONSTRATION Bruce Thompson and Sarah Lowe San Francisco Estuary Institute. 1 Update on Small Tributaries Loading Strategy Richard Looker, Chris Sommers, Arleen Feng, Jay Davis, and Lester McKee Sources Pathways and Loadings Workgroup. 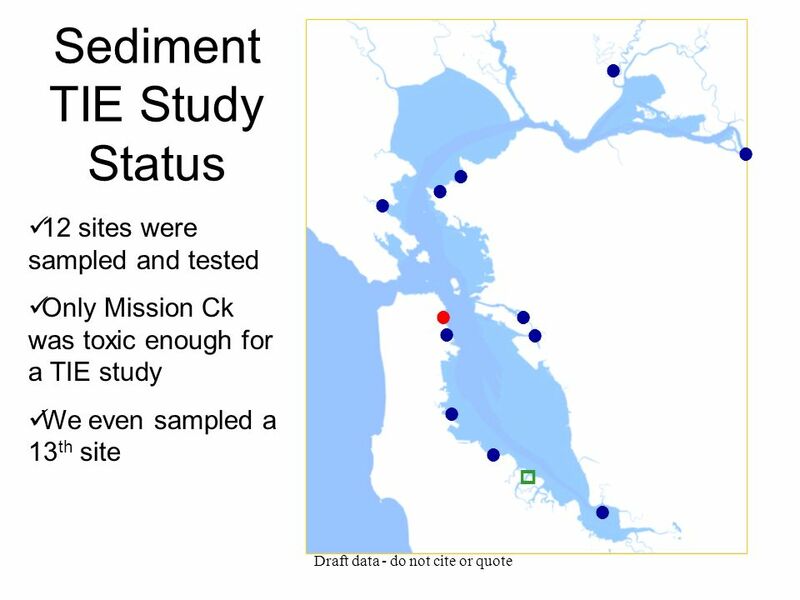 The Influence of Chemical and Physical Factors on Macrobenthos in the San Francisco Estuary A Stressor Identification Method Aroon R. Melwani and Bruce. Agenda Item 3 Causes of Toxicity Amphipod TIE Study UC Davis - Granite Canyon Marine Pollution Studies Laboratory SFEI. SQO 4/7/05 INCORPORATING MULTIPLE LINES OF EVIDENCE INTO SEDIMENT QUALITY OBJECTIVES Stephen B. Weisberg Southern California Coastal Water Research Project.